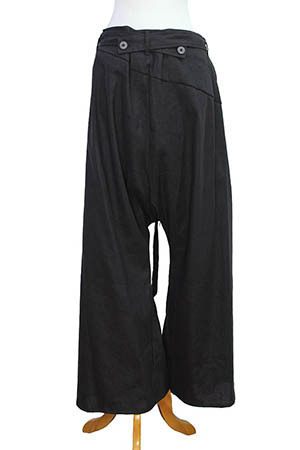 Nostrasantissima very baggy, low-crotch, flared trousers in black, a beautiful linen mix fabric. 2 fabric belts or can be used as braces attached with button, belt loops and extra loops at top of waistband, forwhen belts are used as braces. Wide waist so the garment can be pulled in. Folded section at front middle with off-white stitch detail. Rounded pockets. Diagonal panel details. Brace/belt buttons at rear. These trousers are magnificent, everything about them is right. very strong and very special!